CHAIN OF EVIDENCE (1956). Want to know if you should watch this one? 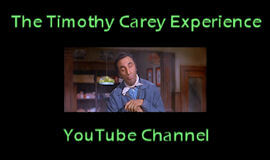 Two words: Timothy Carey. Really, what more inducement do you need? Mind you, Carey has a minor role here, playing a thug who beats affable parolee Jimmy Lydon (erstwhile star of Paramount’s Henry Aldrich films) so badly that Lydon develops amnesia and goes off to work as an auto mechanic in Saugus. Yeah, Saugus … These detective movies have an almost fetishistic devotion to geography, as if the writers were working with open copies of The Thomas Guide. Whereas a lot of Hollywood crime movies of this vintage were shot in LA but rarely got site specific, these films name-drop streets, intersections, and such outlying municipalities as Saugus (long since incorporated into Santa Clarita), Ventura, and Imperial Valley, which adds to the verisimilitude. CHAIN OF EVIDENCE (these titles are fairly interchangeable and have little relevance to the actual plots) is an odd mash-up of Arthur Lubin’s IMPACT (1949) and Tay Garnett’s THE POSTMAN ALWAYS RINGS TWICE (1946), as the amnesiac is hired as a handyman by a rich guy (THE WILD ONE‘s Hugh Sanders) and winds up the fall guy in a murder plot hatched by the millionaire’s avaricious wife (Tina Carver, later the heroine of FROM HELL IT CAME) and her lover (Ross Elliott). Directed by Paul Landres (who went from this to the Allied Artists shockers THE VAMPIRE and THE RETURN OF DRACULA), CHAIN OF EVIDENCE is just peppy enough and well cast (Dabbs Greer turns up as a sympathetic doctor) to keep the middling plot moving to another sitcom-like finish. Poor John Close is knocked down the cast roster even further this time out, playing a state trooper with about twenty seconds of screen time. 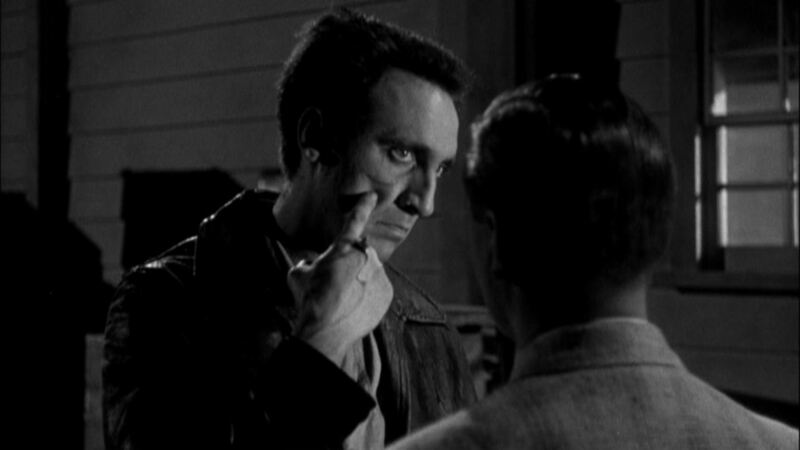 Timothy Carey gets three scenes and stamps through each one of them like his feet are on fire.